The Roving Bantu sounds like a very un-PC name … but fortunately that is what Sifiso calls himself because of his years in exile as part of the South African apartheid diaspora. Jozi-ites were the winners when he met Ashley Heron on a visit back to South Africa 20 years ago. 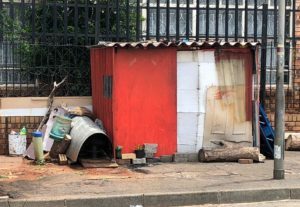 Instead of returning to the States, and, in Ashley’s case, moving to the Cape, they set up home in Brixton and as they say … the rest is history. They now they have 2 children, 2 dogs, 2 cats, 3 AirBnB’s and the Roving Bantu Kitchen. 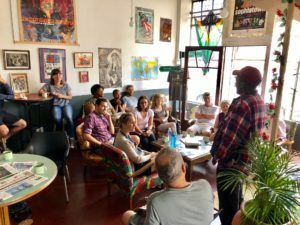 And Sifiso takes walking tours through Brixton and Fietas on the first Sunday of every month. 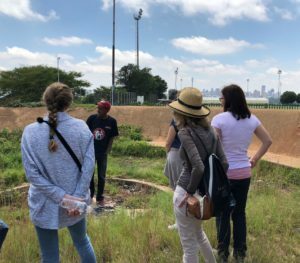 After a brief introduction to himself and his history and context on the first Sunday in February, we ventured out on our walk from Brixton, through Fietas ending up at the Braamfontein cemetery. It was a trip through history – both memorialized in monuments and cemeteries and left forgotten with empty plots and half-demolished buildings like scars on the townscape. Brixton (to the west of Jan Hofmeyr in the map above) is a suburb bounded by Auckland Park to the north and Mayfair to the south. 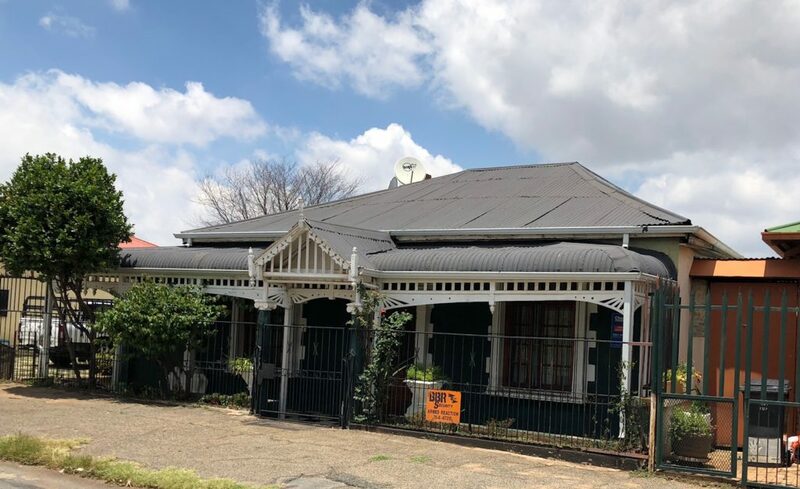 It used to be a largely working class suburb but with its proximity to the University of Johannesburg and the SABC parts have become quite gentrified. Located high on the ridge it has panoramic views to the north, is home to several churches, the Sentech tower, lots of great graffiti and the Kingston Frost Park where there’s a monument to soldiers who died in World War 1. Stay at our well located Guest House and experience the Roving Bantu Walking Tour. View our Rosebank Guest House for Rates and Availability! The Sentech tower, completed in 1962 and named after the then Minister of Posts and Telegraphs Albert Hertzog, towers over a bizarre circular sunken space – dilapidated, unkempt and overgrown. 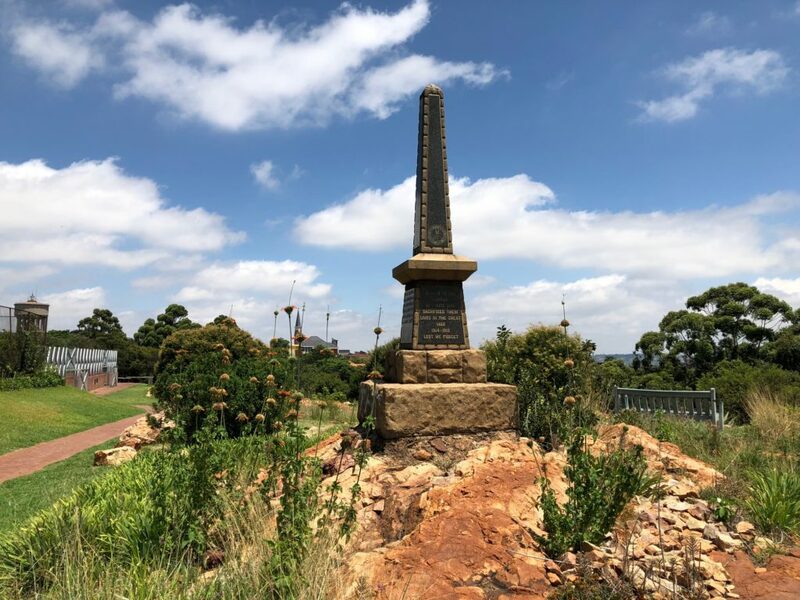 This was the site of a monument built by the Irish Brigade Memorial Fund “in remembrance of the  Irish who fought for the Boer nation in its hour of need [between] 1899-1902″. Designed by Jan van Wijk, architect of the Taal Monument in Paarl, it was unveiled in 1975 by Betsie Verwoed, wife of the architect of Grand Apartheid , H.F. Verwoed. 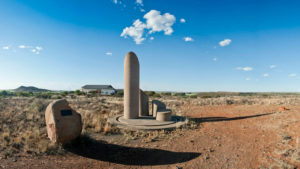 Monument to Irish supporters re-erected in Orania in the Northern Cape in 2002. 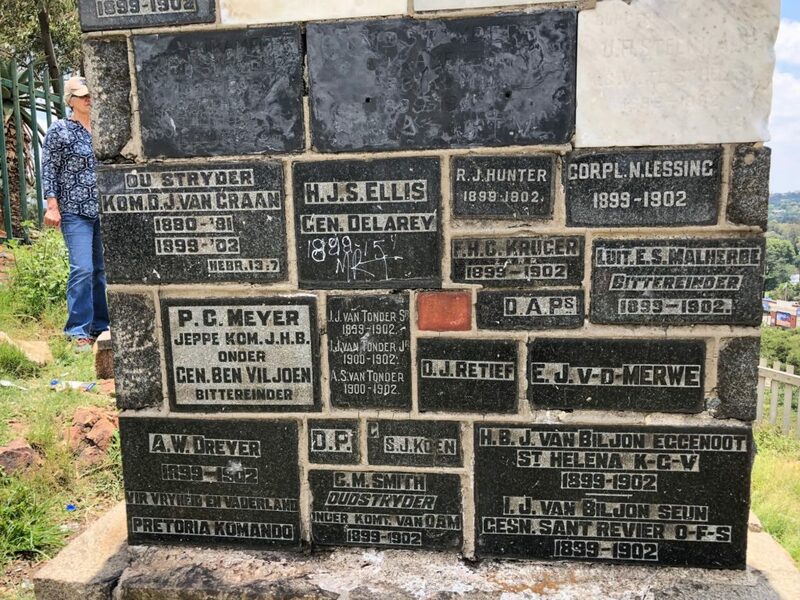 With news of its dismantling, a group Afrikaners took the pieces of the monument down to Orania (the Afrikaner enclave) in the Northern Cape where they re-erected it. 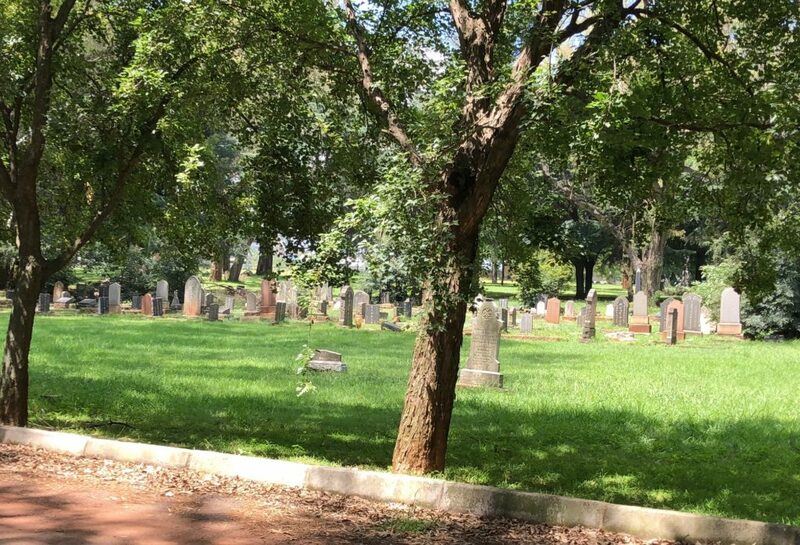 We made our way past the Brixton Cemetry where the first burial took place in 1910 when the Braamfontein Cemetery began to fill up and more space was needed. 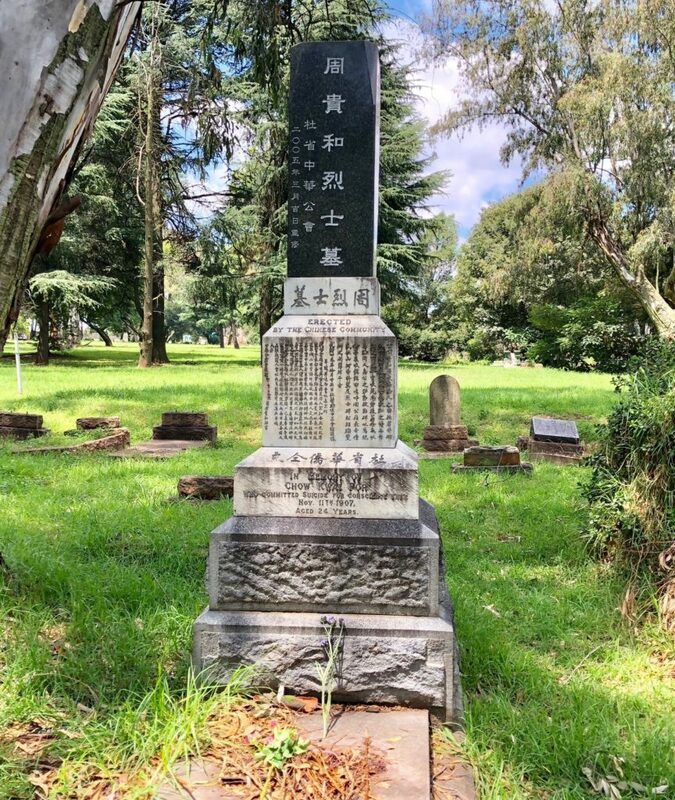 It was the principal Johannesburg cemetery until it reached capacity and was replaced by West Park Cemetery in 1942 (West Park lies beyond Marks Park and the Melville Koppies). However, Brixton comprises many family plots so people continued to be buried there even after West Park had been opened. 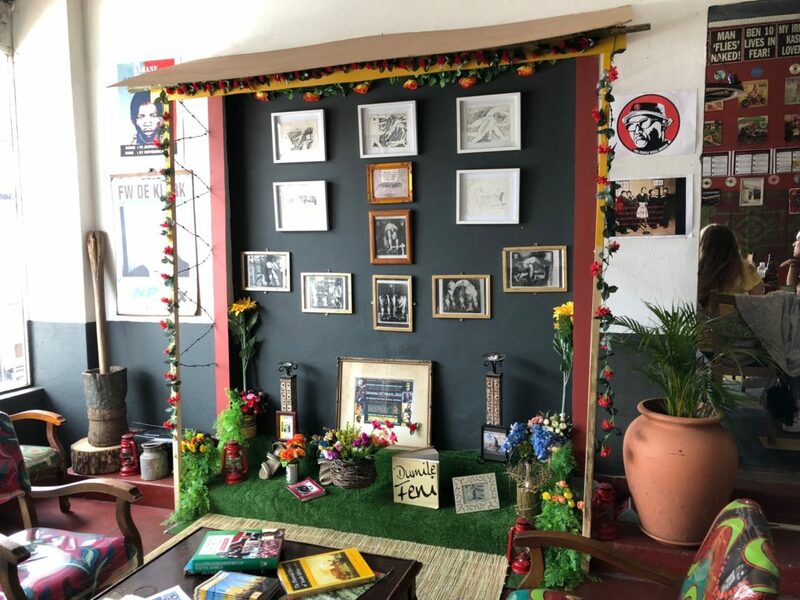 Because of the Hindu presence in Brixton, in 1918 a wood-burning crematorium was built in the cemetery, on land organised by Mahatma Gandhi on behalf of the Hindu community. A new gas fired crematorium was built in 1957 and in 1995 the old crematoruim was declared a national monument. Moving on, we came to Jan Hofmeyr, a suburb which dates back to 1935 when the City Health Department established cheap housing, naming it after the then Minister of the Interior. 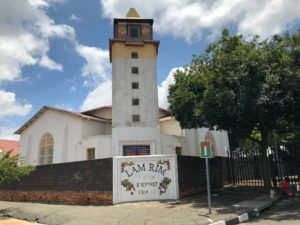 The palimpsest of cultures, religions, identities and histories was reinforced for me when we came across the Lam Rim Buddhist centre (previously the building would have been a church, probably a Dutch Reformed Church) and shortly afterwards a small house which, according to Sifiso, is the home of the South African rock band Die Antwoord. And on to Fietas or Vrededorp (which means Peace Village in English) and Pageview. Interestingly, the history of Vrededorp also dates back to a housing scheme for the poor. In 1893 the ZAR [Zuid Afrikaansche Republiek], set aside land for poor Afrikaners mainly from Brickfields in current Newtown. The inhabitants could only pass the properties to their heirs or to poor people identified by Government. However after South African war 1899-1902, the British did away with these restrictions and speculators moved in. Vrededorp remained a multi-racial working-class area. Also arising out of South Africa’s obsession with race, Pageview has a different history. Historically it had always been a Malay location and in 1943 it was declared a Malay township with allowance made for Indians to own land. 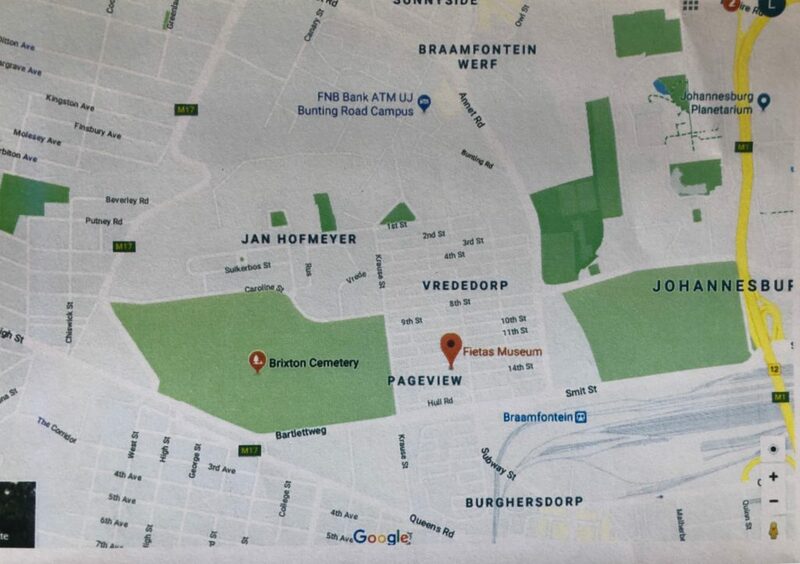 Vrededorp and Pageview became known as Fietas (after all the outfitters in the area) but then suffered the same fate as District Six in Cape Town and Sophiatown, nearby in Johannesburg. 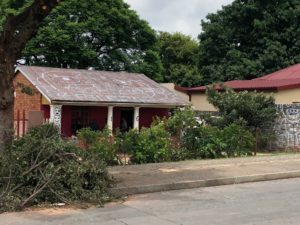 At the height of forced removals under the Group Group Areas Act during the 1970s, residents were forced to sell their land to the government (for anywhere between R100 and R22,000) and were relocated: Indians to Lenasia, 25 kilometres south west of the city, Malays and Coloureds to Eldorado Park some 30km away. 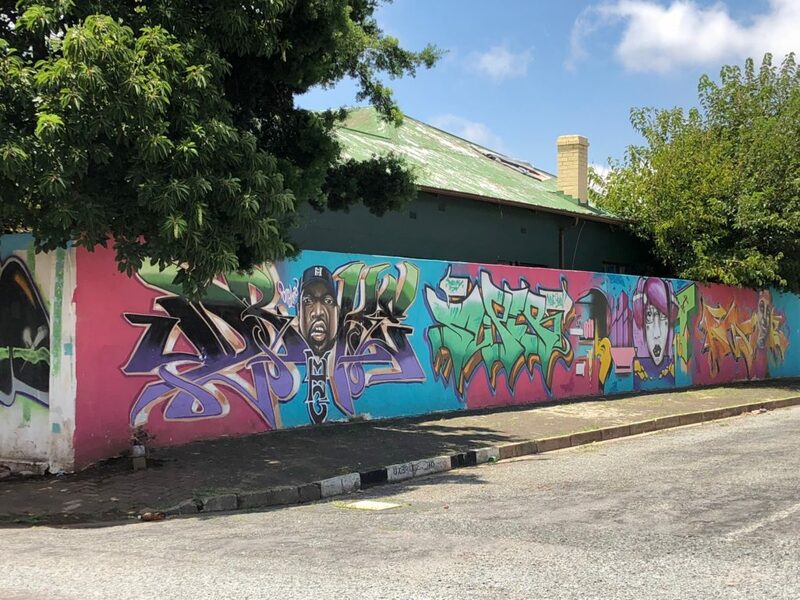 This once vibrant area is a hollow reminder of the violent disruption of Apartheid’s social fabric of faith, family and work with the local community making the best with rubbish-strewn empty plots, run-down buildings, open-air shebeens, makeshift homes on pavements, and the odd corner café or scrap dealer. Sifiso made the point that when people are uprooted from communities with very little to show for it and have to start afresh, it takes a lot to catch up again. 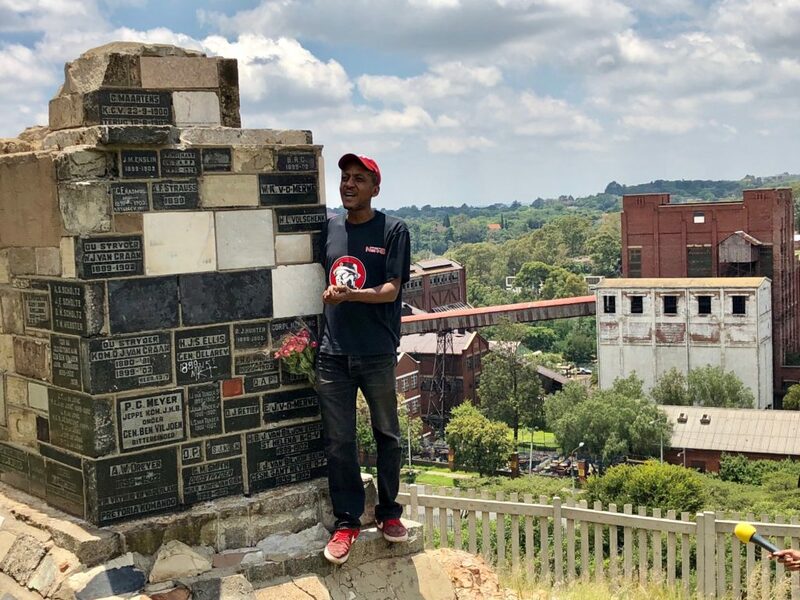 Continuing on to Braamfontein Cemetry past Sunday worshippers we climbed to the crest of the hill overlooking the Gasworks to see the Oudstryders monument commemorating the Boer veterans of the Anglo-Boer/South African War of 1899-1902. 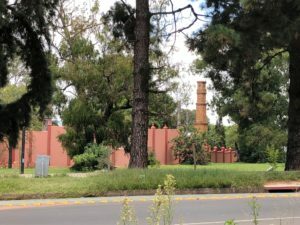 Located on the grounds of the Cottesloe Primary School (now the New Nation School), the site and the monument are in bad condition (and the detritus strewn on the ground around is not for the faint-hearted). This was our final ‘stop’ and the shaded paths and verdant grass were a welcome relief for people like me who hate wearing hats! The cemetery has different sections for different religions which comprise Christian (Dutch Reformed, Church of England, Roman Catholic, non-conformist); Muslim and Jewish. 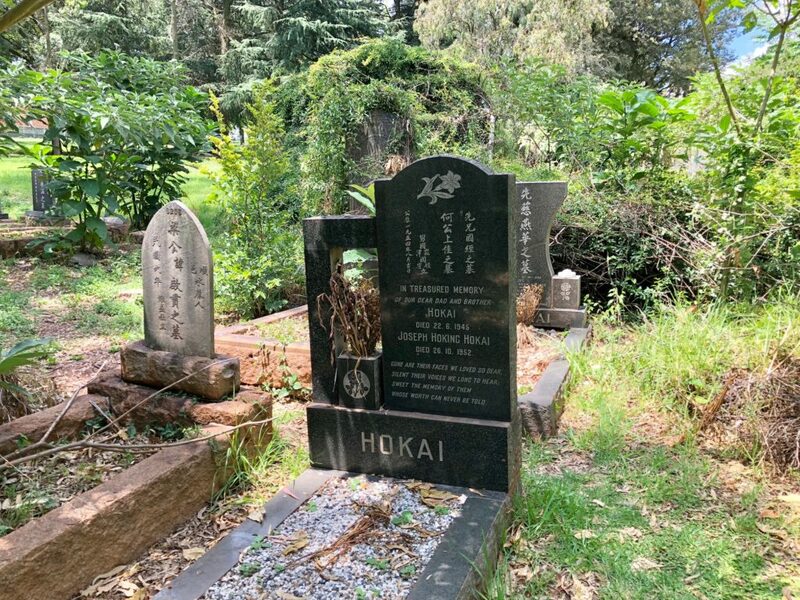 And even the dead could not escape Apartheid – there were/are separate sections for the graves of African, Coloured, Indian and Chinese people in Brixton and Braamfontein cemeteries. The Christian black African section of the cemetery (some 12,000 graves) was referred to as the ‘School of Mines’ in a tragic reflection of the dehumanizing policy and practice of migrant labour. Enoch Sontonga (of Nkosi Sikelel‘ iAfrika fame) is buried there. So when Mandela declared that his grave be declared a national monument, finding it was difficult. 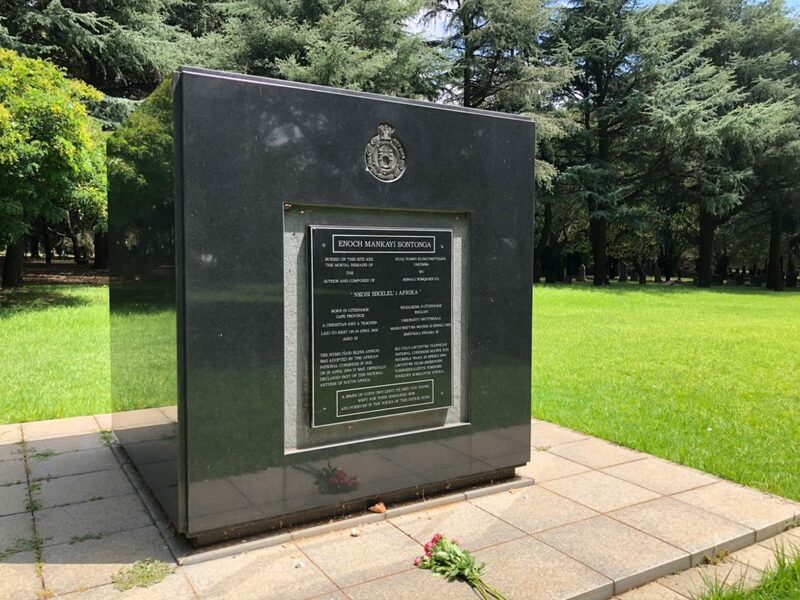 However once found, a large granite monument was unveiled by Madiba on the 24th September 1996 (South Africa’s first Heritage Day) in the centre of what is now known as the Enoch Sontonga Memorial Park. 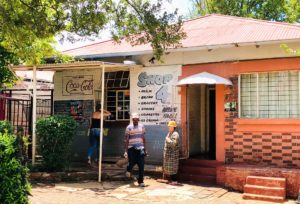 And after a fill of sites, sights and experiences we returned to the Roving Bantu Kitchen (fortunately by car) for the most delicious three course lunch. 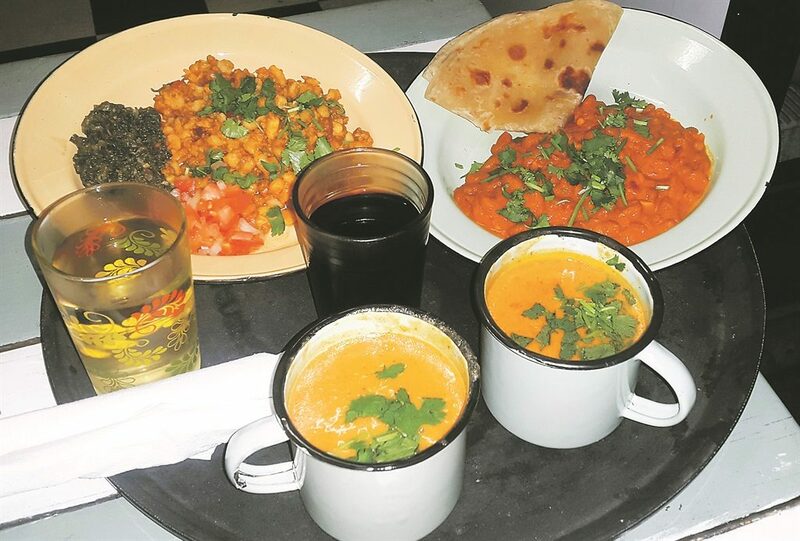 Fabulous cheese and spinach samosas with coriander or pumpkin soup to start; a completely frabjous butter bean curry for mains; and for pud a choice of fresh pineapple skewers with masala; jelly and custard; or coconut samosas. Roving Bantu Kitchen, Brixton. Pumpkin soup was on offer plus delicious curries for mains. 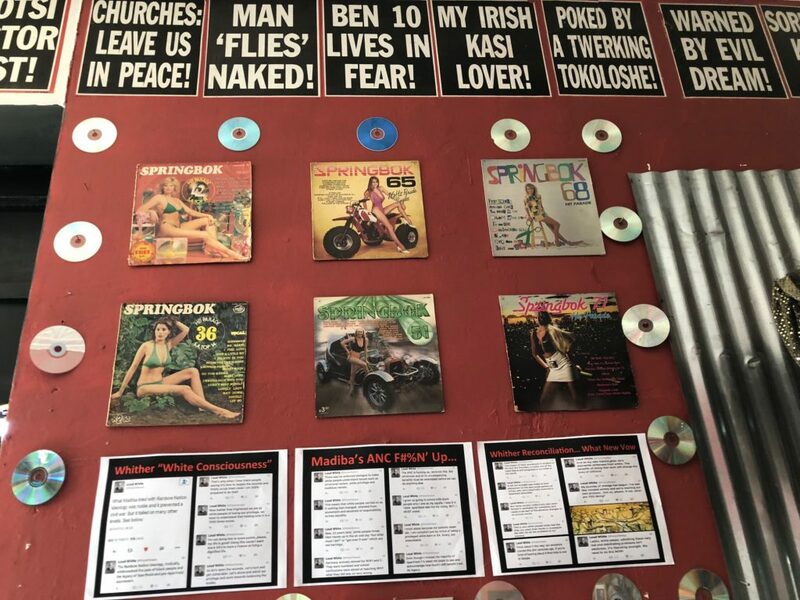 I got to take in more of the quirky memorabilia including old posters as well as the amazing vintage Springbok Radio record covers from the apartheid era. And the Harold Rubin sketches – but more of those in another blog. And as we were leaving lunch some of the group starting chatting to me and asked me where Liz at Lancaster Guesthouse was and would I have room for them this last Sunday. They had won a trip for a KZN safari at a fund raiser all the way back in the US of A. And very intrepid had landed up on Roving Bantu’s tour before taking off for KwaZulu Natal. So thank you Gary and Wendy, Laura and Neil – we LOVE crazy Americans and we are so pleased that you came to stay. You’ll find the Roving Bantu at 125 Caroline St Brixton. And you can contact Sifiso on 072 223 2648 or rovingbantu@gmail.com. Sifiso’s information is by his own admission personal and his own interpretation. greetings. my name is lebohang seemane from gautv news . we are celebrating our culture and heritage month as we remember and highlight the history of our nation. we would kindly love to sit down and talk to sifiso ntuli. please get back to me.